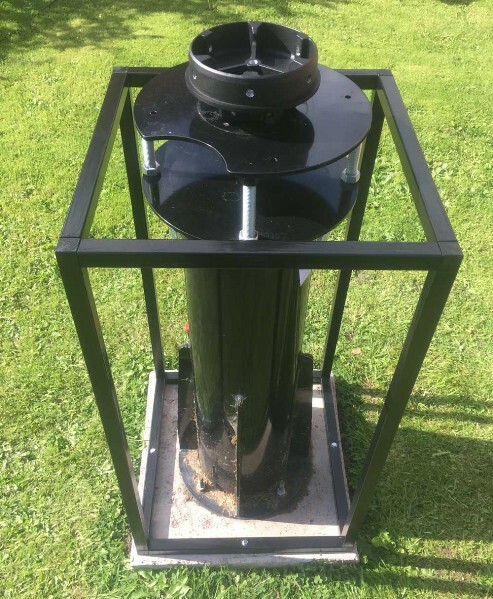 The telescope pier I chose to use was purchased from here at Altair Astro in the U.K and came with all the parts necessary to fit the Celestron CGEM mount and after that a Celestron CGX mount. There are lots of different ways of doing this, however not being a big DIY fan, I went down the easiest route I could think of. Below left shows the completed pier almost finished with just a door to add to the front. I have since run a couple of 12 volt cables under the lawn into the lower pier box for power to the camera, mount, dew heaters etc. The lower right shows the top section which is approx 70cm x 70cm x 70cm. The first top section I made was 1 meter cubed but was way too heavy to lift on and off. 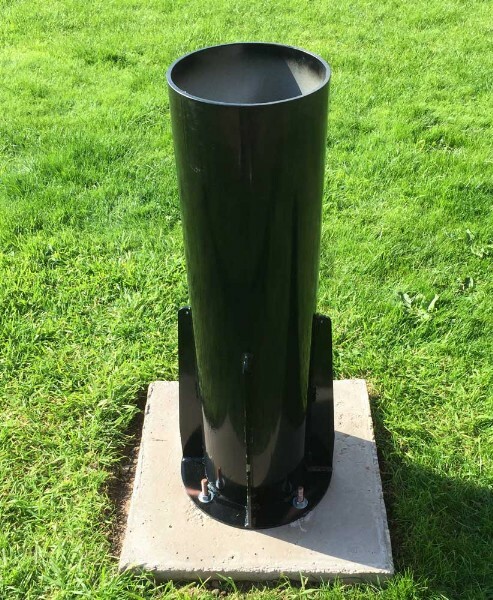 The mount can then be parked after each session, just removing the telescope and the counterweights. On the right you can see the pier has 4 mounting holes around the base to bolt it to the concrete pad. The first thing I did was decide the dimensions of this pad would be 50 cm cubed. The next part involves inserting the 50 x 50 cm plywood panels. 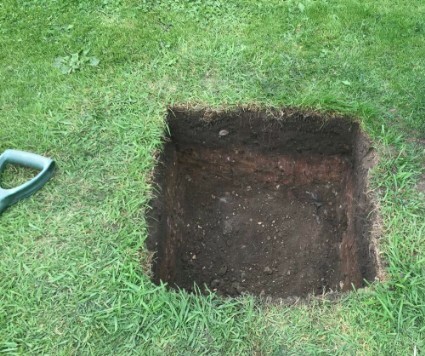 These really only need to be square at the top end so I backfilled some of the "less accurate" sides with wooden shims and dirt to get it all as square as possible. Remember the wooden template I made earlier? the Pier ships with 4 lengths of threaded rod that will sink into the concrete and the pier base will bolt down onto. 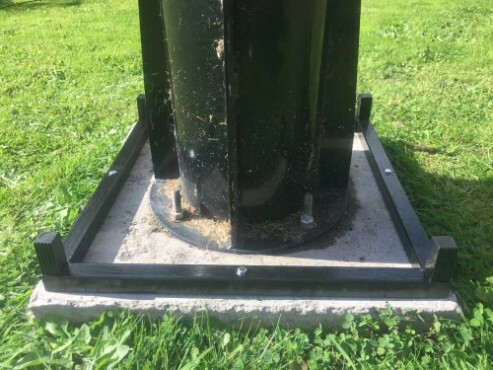 I read on one of the astro forums it was a good idea to attach odd shaped metal brackets to the rods that lie in the concrete as it prevents the rods pulling up through the concrete when you tighten the base bolts. 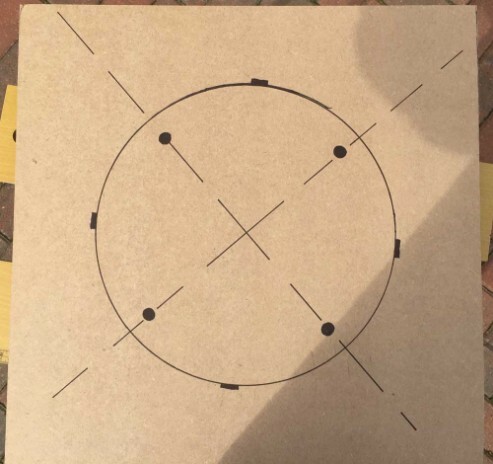 I purchased some brackets from a diy store as shown in the photo. 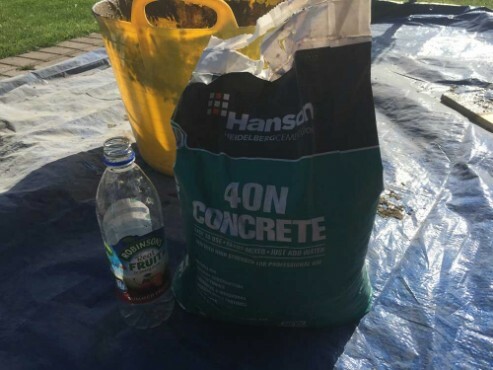 I have not really had to use concrete before so I purchased some of this readymix stuff to mix with water in a bucket. 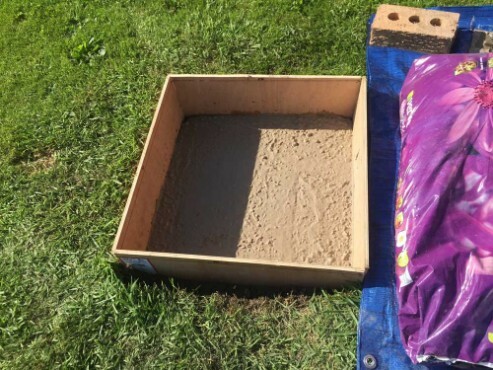 You can calculate how many bags are required as each bag tells you the volume of concrete it produces. I still found myself 3 bags short and had to return and get more. The readymix concrete will probably need to be smoothed off on the surface once it has been poured. 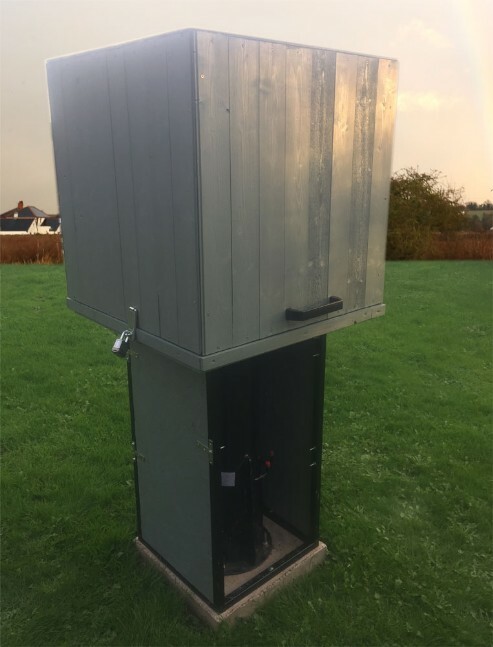 I filled the cube until it was approx 5 cm above the ground level so rainwater did not pool over the 4 fixing bolts at the pier base. I don't know how important this next part is as there is lots of adjustment on the top of the pier but anyway, I inserted the base template and gently tapped it down until it rested on top of the concrete. I used 2 spirit levels placed across the template and got them horizontal in both axis, then waited 3 weeks for the cement to harden. The next step is to remove the wooden template and the sides. 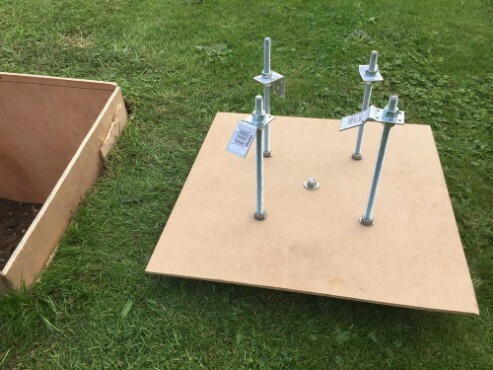 I thought this was going to be extremely difficult however a couple of knocks with a wooden mallet was enough to dislodge the 4 sides and extract them. Here is an image showing the pier bolted in place on the concrete cube. 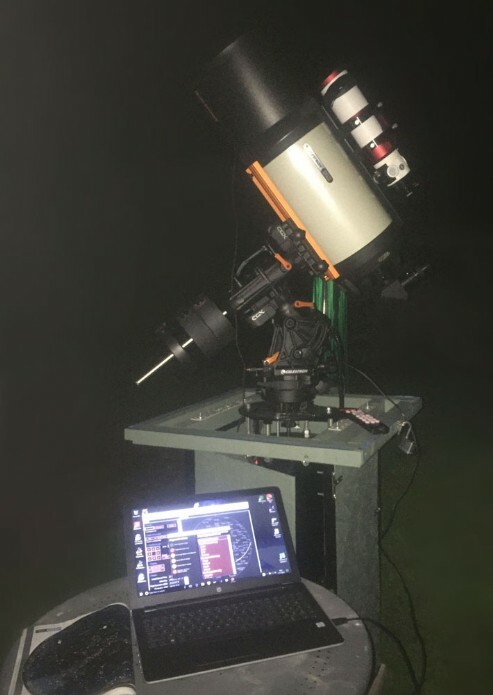 Here is an image showing the Celestron CGEM ( and as it turned out later CGX ) pier adaptor hardware that ships with the pier. 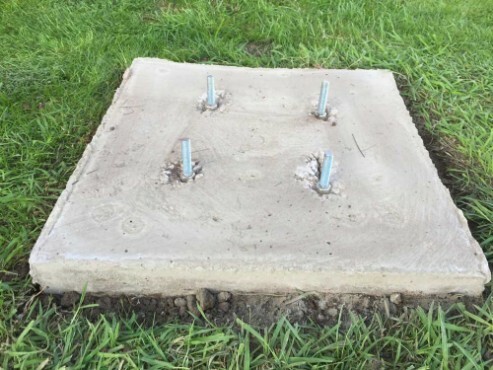 You can make a number of adjustments to get your mount level so I would not worry too much if the concrete base is not perfectly square. The next step was to box the pier. I decided to use "speedframe" and I suppose, depending on your nationality, will be known by a different name. It is square section metal with various corner mouldings that allow you to join them and build a skeleton type structure. On the right here you can see the bottom of the speedframe bolted onto the concrete base. 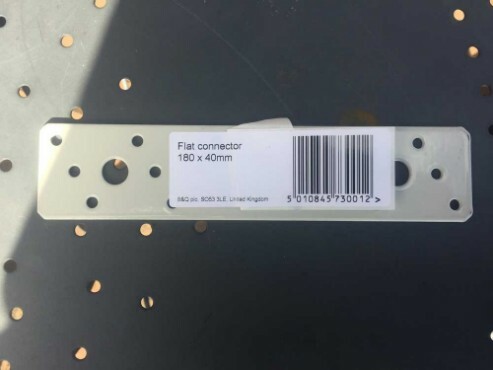 I used a supplier in the U.K called The Metal Store at www.themetalstore.co.uk who were very accommodating, particularly when I mistakenly ordered the wrong size corner connectors which they very kindly exchanged for the correct size. Here is a photo showing the final sections of the speedframe ready to be secured to the top section of the pier. 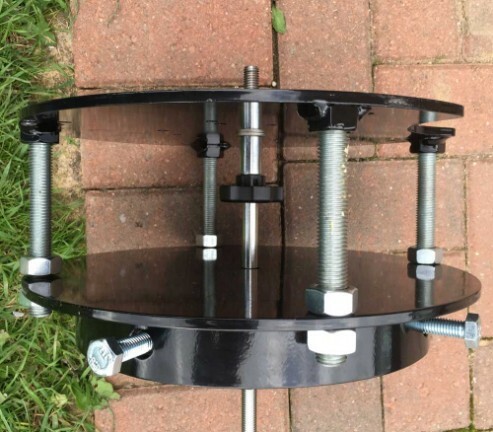 The CGX ships with a tripod, just remove the tripod legs and you can attach the remaining base to the existing CGEM mounting bolt. 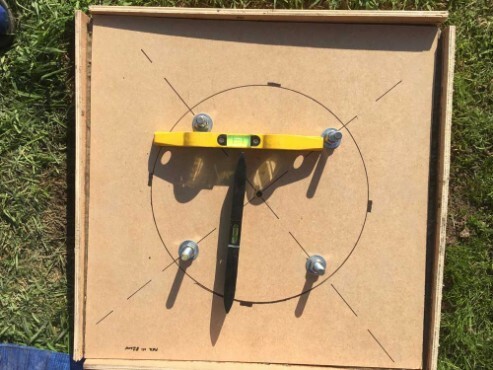 The final stage was to drill into the top of the speed frame on each of the 4 sides, use these cheap plates I got from a local DIY store and bolt them to the top of the pier. The speedframe structure is very stable as it is held in place by the Pier and bolted into the concrete base. 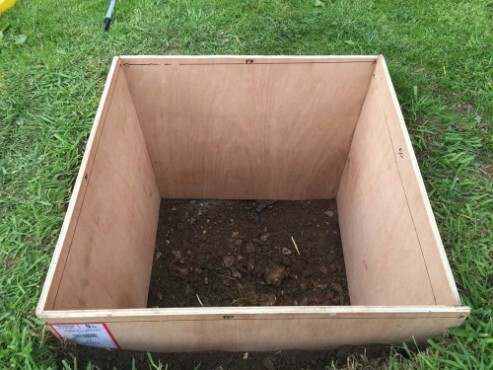 With the complete base assembly completed I decided to construct a 1m x 1m x 1m wooden box for the top section. 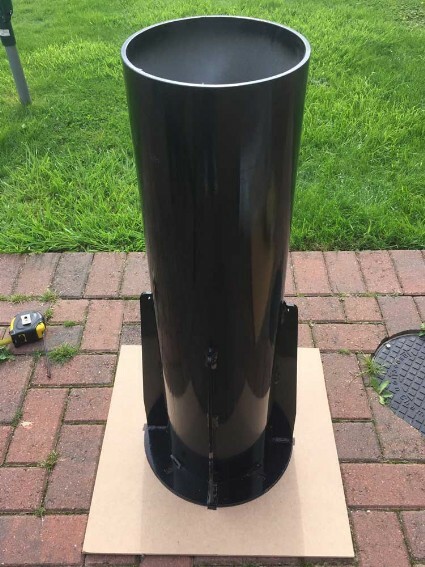 Sadly this was way too heavy to lift off and on so built another one 70cm x 70cm x 70cm which is lined with insulating material and waterproofed. The structure has survived the winter and a couple of storms that swept over the U.K recently.